This versatile belt mounted pouch will hold almost any pistol magazine, single stack or double stack. This versatile belt mounted pouch will hold almost any pistol magazine, single stack or double stack. 1911, HK 45, M9/Beretta 92, Glock, XD mags are all held securely and deployed easily and silently on demand. The pouch maintains a positive, adjustable grip on its contents without additional securing systems needed. 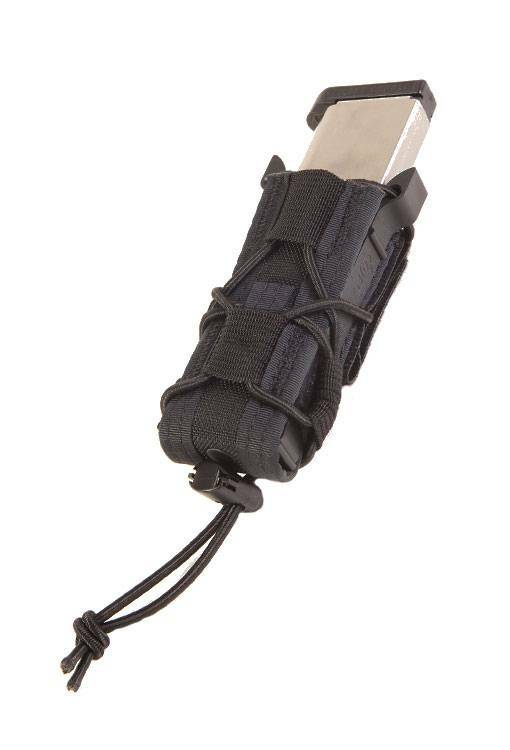 The Pistol TACO® - Belt Mount can also hold a variety of multi-tools, knives and flashlights securely. Covered by HSGI's® Lifetime Warranty. Made in the USA. Protecting and caring for VELCRO® Brand products will help maintain their strength and gripping power and extend the life of the product. This is especially true for apparel closures that are left exposed for extended periods of time or that are subject to repeated machine washing and drying. Over time, the hook surface can pick up lint and other debris that can affect its ability to grip the loop surface. Cleaning debris out of the hooks is similar to cleaning hairbrushes – and using a stiff brush or another piece of hook are the best methods. It can take some effort because the hooks in the tape are designed to grab. The optimal solution is prevention: the hook portion should be covered at all times, so it does not grab onto anything it should not – like a blanket or hair. Always engage the hook and loop before washing. Velcro One Wrap® products will wear out with overuse. Attaching and removing belt mounted pouches from belts frequently will reduce effectiveness of the Velcro®. Performance and lifetime of pouches will be extended if pouches are mounted infrequently.